And all I wanted was a translation of that pic found on the AGP portion of Barkhorn's page. Alright, so all my knowledge is baseless conjecture, I guess you also talk personally to the designers and directors themselves, so I'll leave you be. About the box, that first partnership was advertised, subsequent ones were not. If you care to look at the artists involved in each figure, you'll see some are either freelancers, double agents, aliens, or, you know, collab workers. And as far as I know, no one has introduced new witches. So that has me double worried. royalpain88 wrote: And as far as I know, no one has introduced new witches. So that has me double worried. Full AGP set was already shown at last years figure show, basically it is a sit and wait game at this point. All that being said, I would love to see a legitimate collaboration between the two companies to finish the squadron. Leave the figures to the Figma team and the accessories to Bandai. Best of both worlds. Hell, sell them as a boxed set for some stupid amount and I'd still be game. Probably. They may never sell as a box set but squadron was completed last year and shown on display figure show. Although not all have been given dates to get them in your home collection they are done. How did that evaded us in the past? MORE PICS! I have seen the full squadron pics in the past but not with the Me262 strikers. royalpain88 wrote: How did that evaded us in the past? MORE PICS! I have seen the full squadron pics in the past but not with the Me262 strikers. Not sure but maybe we will luck out and get them with maybe Yeager. I keep my eyes peeled for AGP release info between normal means and friends over seas with closer gained info. Wish AGP would stop messing around and release their version of Lynette already. It'll compliment my collection consisting of a Figma, Sega Prize fig, and 2 nendos (standard one and swimsuit version included in the PSP Hakugin No Tsubasa bundle). Pics later, can't find my camera. OshareKeiji wrote: Wish AGP would stop messing around and release their version of Lynette already. =P I'd prefer a witch that hasn't been released in any action figure form tbh. So far we are at roughly 2-3 witches per year between AGP's other girl lines. Hopefully we see at least 2 more this year since Hartmann counted as 1 for this years release....lets all hope that IS project doesn't hinder any witch releases time wise. Charlotte Yeager is on the top of my to get list though I bet she will be towards end of releases. 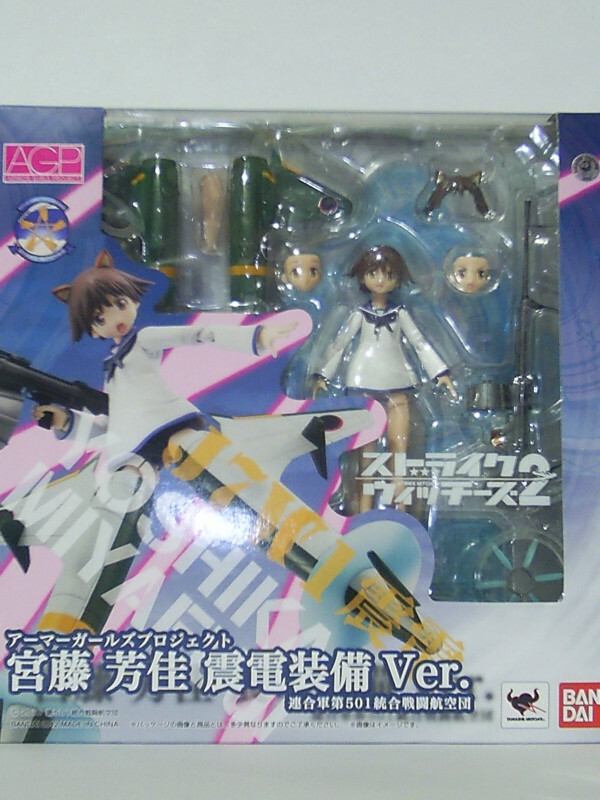 My first AGP Strike Witches EVER!! Found Miyafuji only for US$23 in a hobby shop near my working place. That's SO cheap, compared to other hobby shop who sells it for 72!! I'm planning to snag Sakamoto too, maybe next month, in the same hobby shop, only for US$32. Is it worth it?